My son Jon and I had one more day in Inverness, Scotland, to try and find Ardclach Parish and Lynmor where the children of Alexander and Christian Douglass were christened prior to their sailing to America. I had been asking questions about the Cawdor Heritage Group of people wherever I had opportunity but got very confusing answers. I thought this group of people local to the area could give us the best current information. The Archives in Edinburgh had been disappointing. The information they had, I already had, names and dates, and places. In Inverness, the Highlands Archives gave us our first really good information: maps of the Ardclach area. While they would not copy the survey maps for us, they did allow Jon to take pictures with his phone camera, which he could then enlarge, so we could plan a route. When we walked into that Archive and said we were looking for information about our family that had lived in Ardclach Parish, in the village of Lynmore, a man spoke up immediately and said “it was not a village; Lynmore means large enclosure. They were farmers.” Finally! we had met someone who actually knew the area well! It was an Eureka moment for me. Inverness Archives further referred us to the Nairn Museum. This was only a few miles from Inverness, so it was no problem to stop in on our way through Nairn, headed for the only thing on the road map that, up to this time, had given us any hope: the Ardclach Bell Tower. We stopped for lunch in Nairn at the only restaurant listed in the guidebook, The Classroom. We had a lovely lunch and then we visited the Nairn Museum. When we told the small group in Reception where we wanted to go and what we might find out about Ardclach Parish, the ladies all looked at each other and said to us, “you need to talk to John; he’ll be down directly for his tea”. Again, what a pleasure it was to talk to John who knew about the old church that was built in 1626, but, he said, “ it’s all boarded up now”. We said we’re going anyway; we want to stand on the land our ancestors stood on; we want to look in the grave yard. We want to see where they christened their children. We learned that the Cawdor Heritage Group had actually had some of their archives in this museum on loan recently. We saw a few things upstairs before we were on our way again, like hounds on the scent, we had a strong feeling, this time we were going to find it. Using the pictures Jon had taken of the maps on his phone, he navigated us down many, many narrow, surprisingly well-paved country roads. Then we saw the sign that said Ardclach Bell Tower and turned that way, found a place to park the car off the road a little, and followed the signs on foot. We climbed the arduous stairs up to the tiny belfry tower, (even I had to stoop to enter the door) Jon gave a tug on the bell pull, and it pealed out over the valley. John, at the Nairn Museum, told us the bell in the bell tower was from the old church, installed there when the little church closed. A “new” church had been built on top of the hill about a quarter mile from the bell tower. The bell tower is small and stone, has a fireplace in it, with the initials MGB set into the mantel. It is believed the initials belong to Margaret Brodie. It is hard to believe that anyone could have lived in that small building, let alone raised a family there. The building is kept up by the local Heritage Council. Climbing down the stairs, and back in the car, we drove down a steep zigzag road to the valley floor many hundred feet below, where the old church still stands. We had been able to see it from the access road to the bell tower. There was a van parked in a parking space at the church. We thought perhaps others were looking for their ancestors. Then we saw two men fly-fishing in the river behind the church. We wandered around the cemetery. A man was doing some work nearer to the church. Eventually our paths crossed. It turns out this man, John Hamilton, and a couple partners have purchased the building and grounds and John’s dream is to restore the church and make it available for occasional services or weddings or funerals. (There are graves still available in the church yard and evidence that a few families have recently updated their family monuments.) His father once preached in this little church, and he knows all the history. He even told us that when our Douglass family would have been going there, the windows in the church had been square. A few years after the Douglass family left, in 1779, a modest addition was made to the one room church and later arched stained glass windows had been installed. Of course many of those windows are broken now. John is retired and lives in his camper van, when he is working on the church. He says “what else am I going to do?” He is a man with a mission. 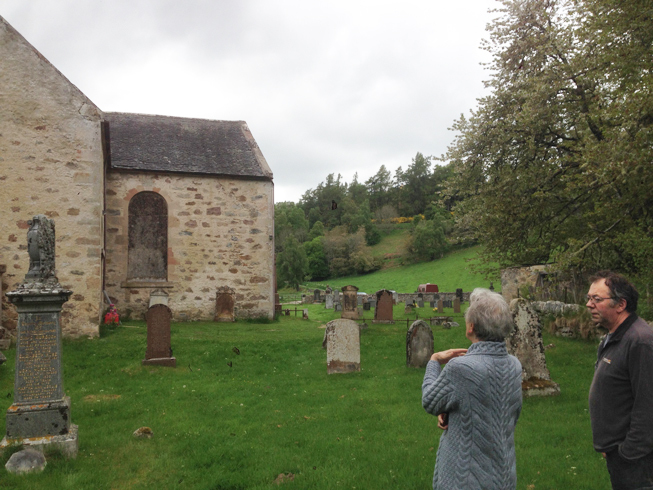 We found no legible grave stones in the church cemetery that we could connect to our Douglass family, but there were familiar surnames there and Mr. Hamilton says the location of all the graves has been logged on some Ardclach website. The next challenge for me will be to find it. This is a picture of me and Mr. Hamilton. We did it! I told Jon I don’t know exactly what I expected, but I didn’t expect this, meaning the rugged, hilly, forested land, the steep hills towering above the river bottom where the little church stands. Mr. Hamilton told us that once there was a bridge across the river a short distance below the church and families would come down the opposite hillside, which must have been a feat (they either walked or rode horses) and crossed the bridge to go to church services. When the bridge fell in, it was not replaced and the church closed. We figure the Douglass family would have come that route to church as Lynmor, or “large enclosure”, was across the Findhorn River, according to the survey map. It was an experience of a lifetime for me. I will never forget being there. Jon has lots of pictures to keep the memories alive. This entry was posted in Uncategorized by ethelingalls. Bookmark the permalink. Wow, Mom! What an adventure!!! It’s so neat that you found people who had more info and could help with vocabulary and details, each place you went! That’s more than I would have hoped for! Thank YOU! And thanks to Jon and Beth, too! Wow! You and Jon deserve the Sherlock Holmes medal for your detective work. I’m looking forward to seeing more pictures and whatever additional information you’re able to get as a result of your work. Oh dear! I feel quite emotional at what you experienced. Monumental Inscriptions, Parish of Ardclach, compiled by members of Moray & Nairn FHS, 44pp. ISBN 978-0-9566780-0-3 – £4.00, p&p extra. Have you found evidence of their departure? No, I did not, but I have some new leads. I am using 1773 as the year they arrived in America because that date was used by several different Douglass branches. The best source is the Genealogy of the Canadian Branch of the Douglass Family by Wilfred Douglass who transcribed his father’s memories in 1926. His father and others in this branch of the family had some research done on their behalf in Scotland, but nothing definitive as to ship they sailed on or when they arrived in Boston, except the story is they arrived at the time of the Boston Tea Party. Hello! I found your website while researching information on my Douglas(s) family heritage. I’ve successfully traced my family back to Alexander Douglass of Ardclach, Scotland. Alexander appears to be my 5th Great Grandfather. My grandfather is Dewey Douglas; son of William Leonard Douglas, grandson of George Washington Douglass; grandson of John Douglass; son of Alexander Douglass. My heritage falls off at Alexander Douglass, not knowing his father/mother. Anyway…I found it interesting that I found your site. It appears we may be related. The farm of Lynmore is up a track to the right which is just on the other side of Dulsie Bridge further up the river Findhorn from where the church you visited is situated.. I’m not sure it is used now as I rather think the house and buildings were falling down the last time I was up there which was around 1969/70. Try Google Earth.